Pond Cottage01263 715779work01603 870304fax Self-cateringA charming converted barn, Farm Cottage, is all on one level and open plan so it easily accessible throughout. A perfect getaway for two to enjoy the delights of the North Norfolk Coast whilst still being within easy driving distance of The Norfolk Broads and Norwich. • Outdoors: Fully enclosed garden with garden furniture, barbecue and unfenced pond. Children need to be supervised at all times near open water. Pond Cottage offers weekly bookings starting on Saturday. 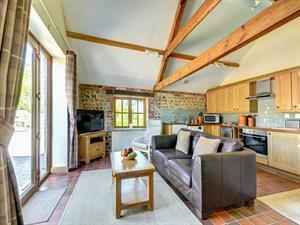 A charming converted barn, Farm Cottage, is all on one level and open plan so it easily accessible throughout. A perfect getaway for two to enjoy the delights of the North Norfolk Coast whilst still being within easy driving distance of The Norfolk Broads and Norwich.